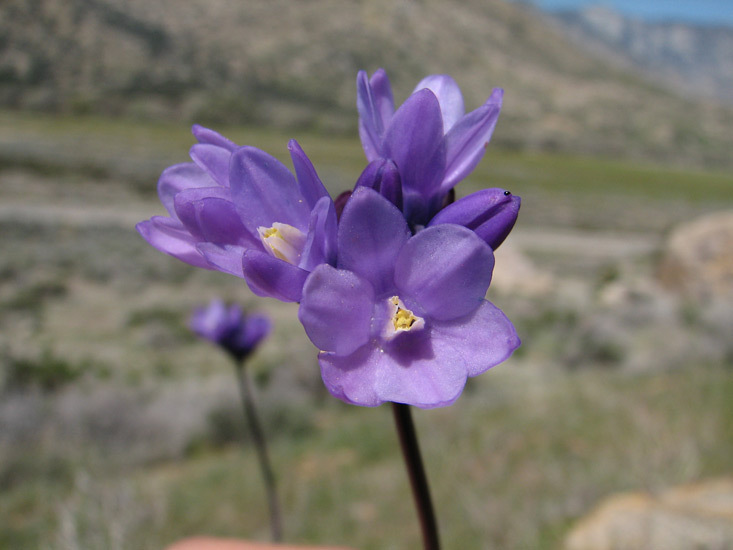 Dichelostemma is a genus with five species including one with two subspecies distributed throughout the western United States, but concentrated in northern California. 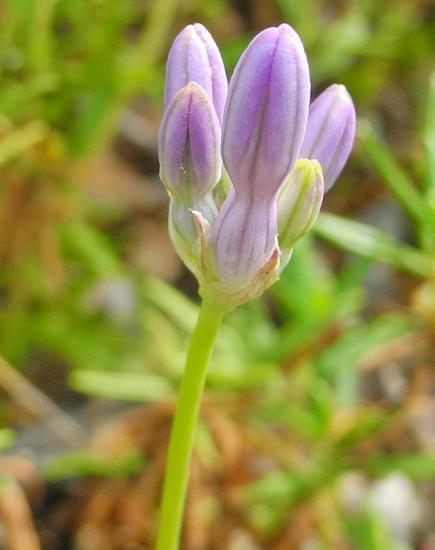 Once considered a taxonomic section of the genus Brodiaea, it is now considered a distinct genus. 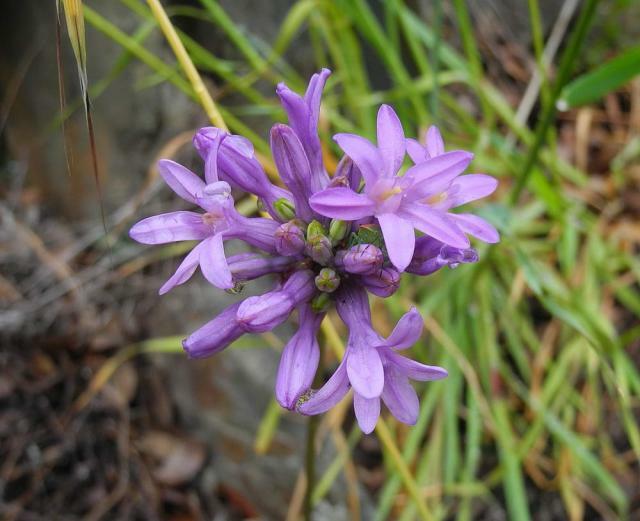 It has been considered to be in various families in the past: Amaryllidaceae, Alliaceae, Liliaceae. 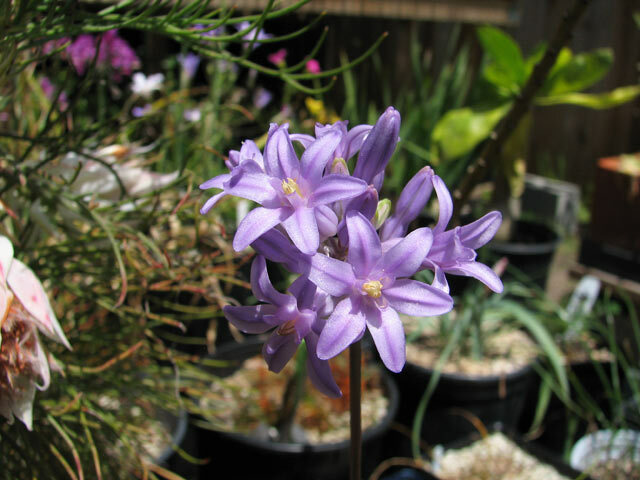 It is now placing it in a new family, Themidaceae, which includes other California genera (Androstephium, Bloomeria, Brodiaea, Muilla, and Triteleia). 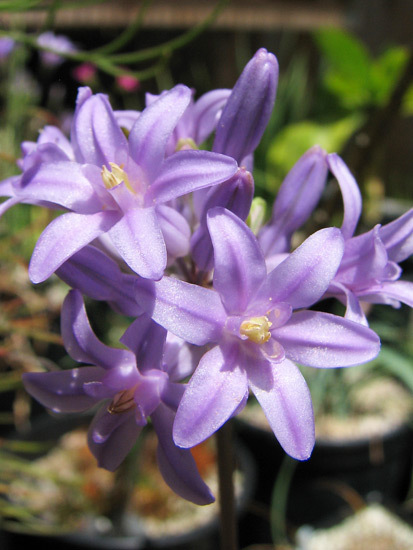 The Angiosperm Phylogeny Group III placed this family into Asparagaceae as of 2009. 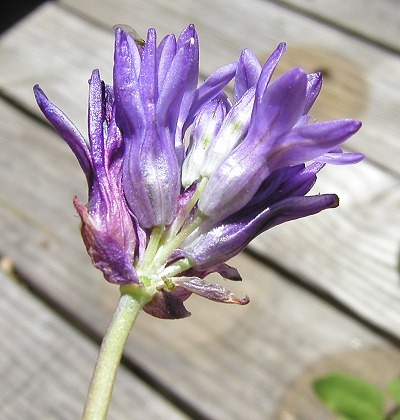 Dichelostemma is differentiated from Brodiaea by a flowering stem that is generally curved or twisted (not straight), an umbel that is typically dense and not open, and with some of the species having filaments that are crown-like, forming a tube outside the anthers. 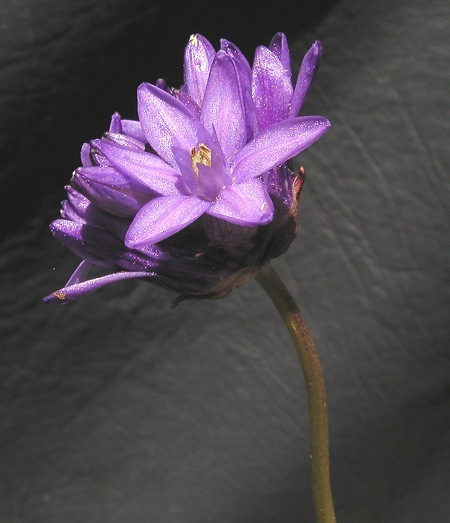 One species, Dichelostemma volubile has 3 false stamens like Brodiaea, but twines and has the tight umbel. 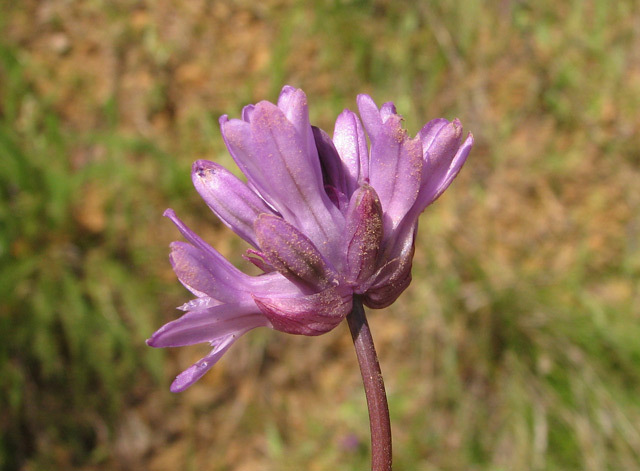 Dichelostemma is differentiated from Triteleia by having a dense umbel rather than an open one and having 3 stamens instead of 6 (exception is Dichelostemma capitatum which can have six) and filaments that are crown-like, forming a tube outside the anthers in three of the species. 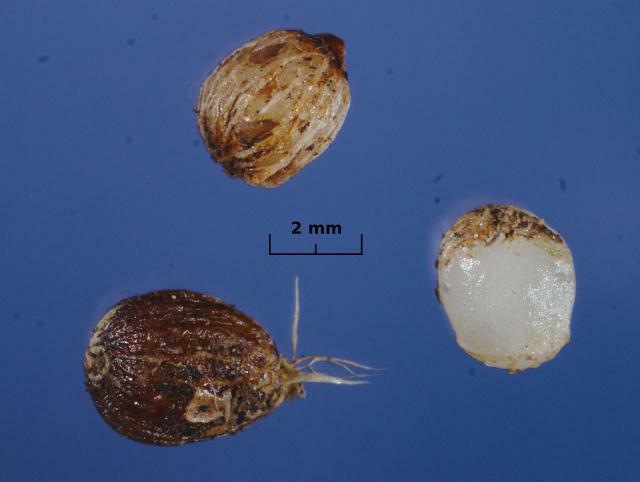 The species can be grown from seed started in the fall. 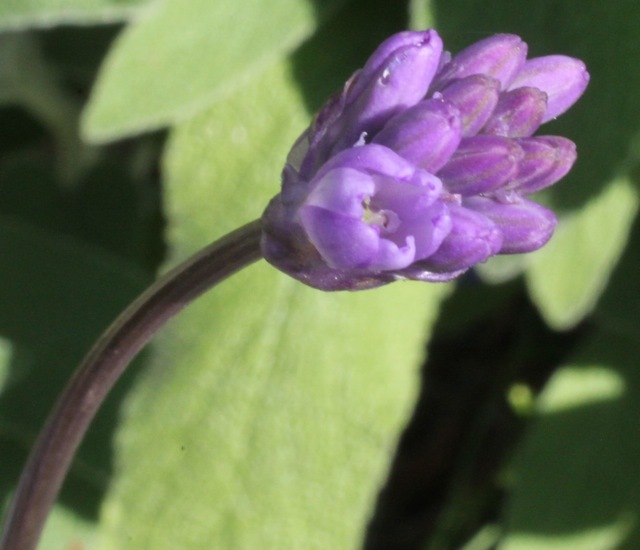 Dichelostemma ida-maia has the reputation for being the most challenging from seed and may benefit from a wide range of temperatures between day and night for success. Seeds sown in fall and receiving continuous water will not sprout until early January after a few cold spells. The seedlings will need plenty of free root-run to do well. They are also benefited with sparing fertilization. 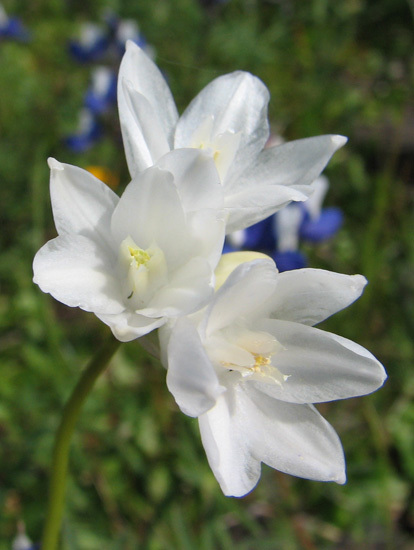 Most species can also be propagated from the offsets that are produced around the corms. 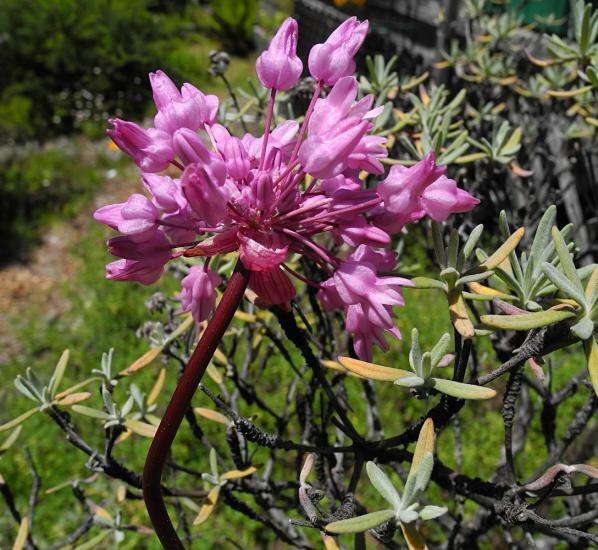 They grow during the winter rainy season and then bloom as the days get dry and warmer when their leaves start to shrivel. They go dormant in summer and do not sprout again until after it starts to rain in the late fall. 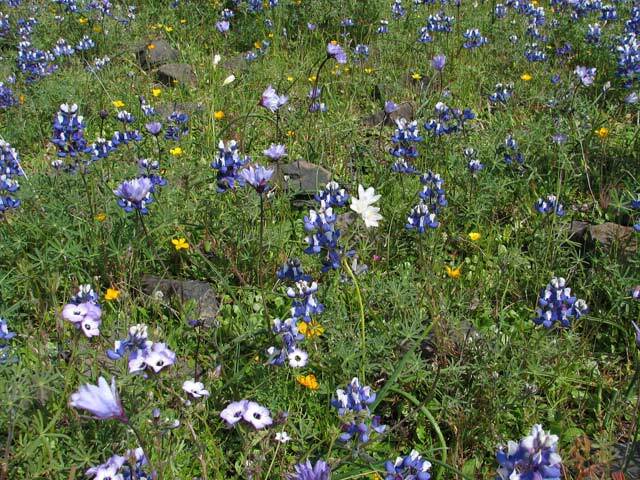 As they are found in a wide range of elevations in nature, species grown from wild seed may exhibit different degrees of hardiness. 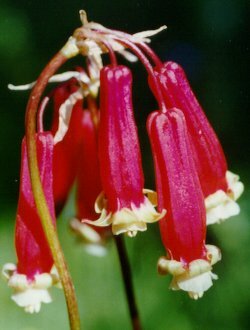 For more information, visit Mary Sue Ittner's post on the Introduction to Dichelostemma when it was the topic of the week in May 2003 on the pbs list. 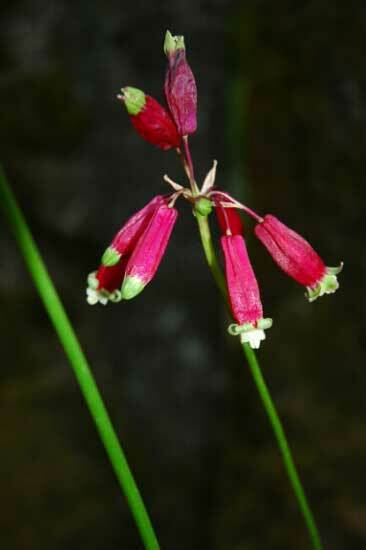 Dichelostemma congestum is commonly know as forktooth ookow or congested snake lily. 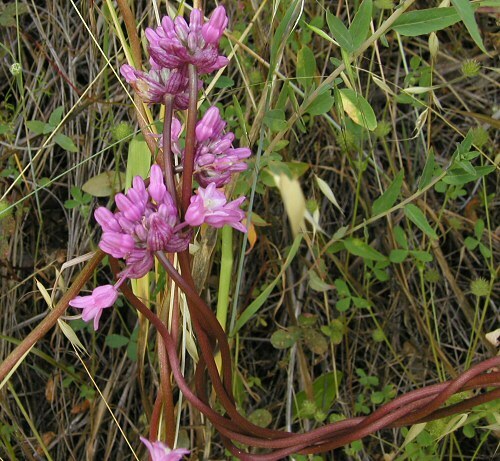 This plant is found in meadows and open woods from central California extending north of California into Canada and less commonly in the Northern Sierra foothills. 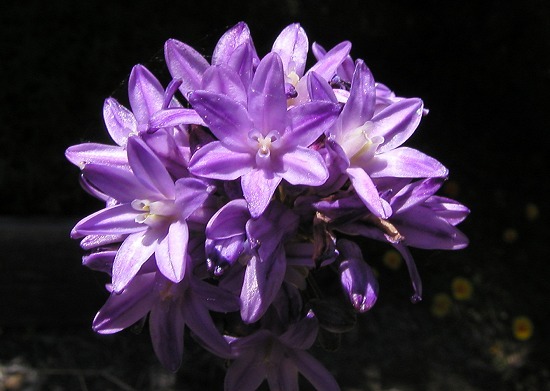 It blooms from April to June carrying dense, many-flowered clusters. 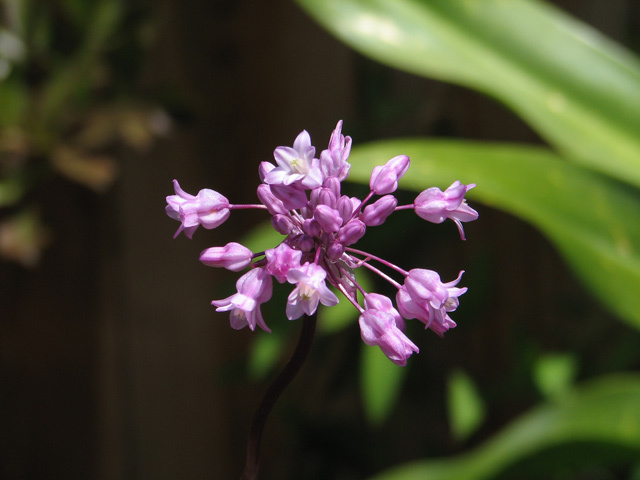 The individual flowers can range anywhere from a bluish purple to pink in color. 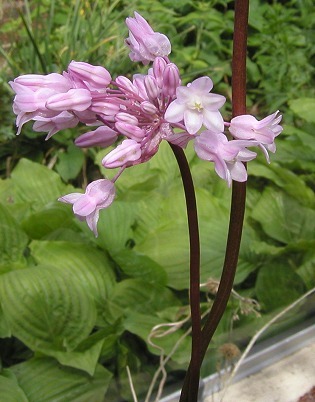 The flowering tube is pinched slightly at the top and the filament crown is forked. Photos 1-2 by Bob Rutemoeller show the forked crown and the tube. Photos 3-4 are from Richard Haard. 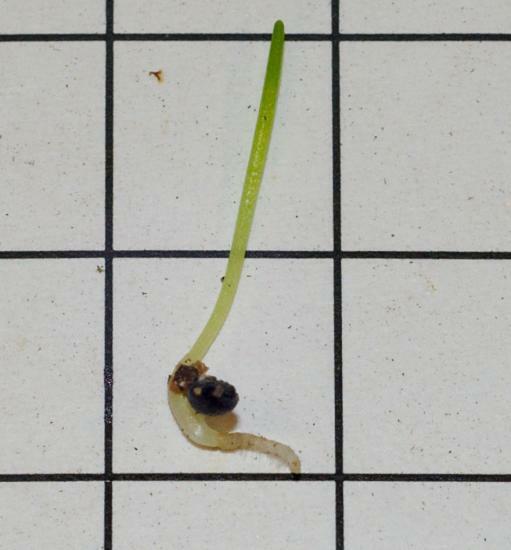 First photo by M.Gastil-Buhl shows corms on a 1 cm grid, from Brent & Beckys, planted in October. 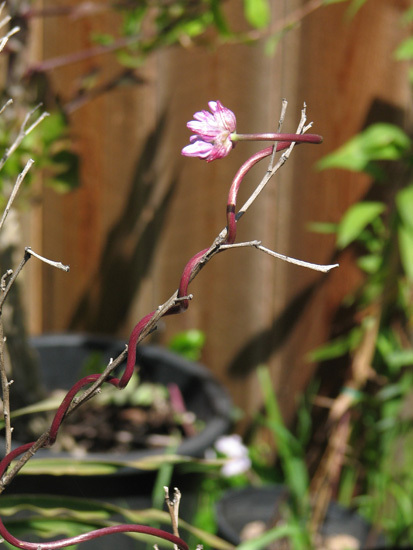 Second and third photos are bud and bloom from those corms, in May and June. 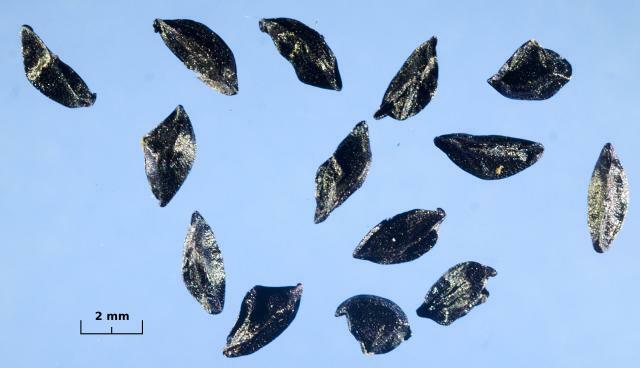 Remaining photos by David Pilling show seeds from those same plants, and a seedling. Seed sown in summer germinated when temperatures fell at the start of autumn, seed sown in autumn germinated in the middle of winter (outside 32-40 °F); the seedling (from the summer sown batch) is pictured on a 1 cm grid at the start of January. Final photo shows one year old corms. 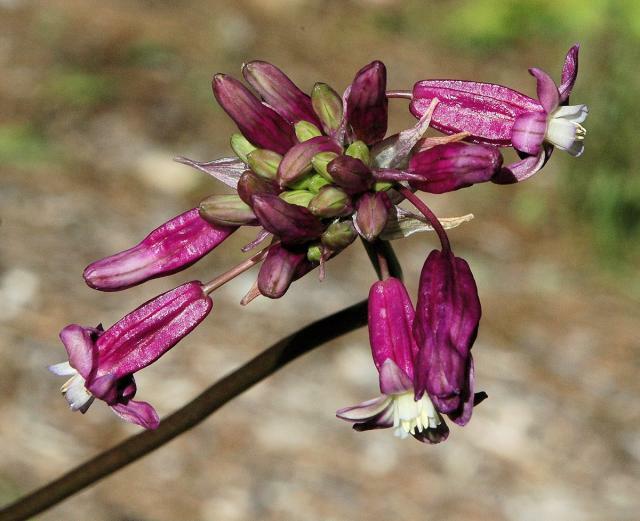 The photos below were taken by Nhu Nguyen on a trail of the Stebbins Cold Canyon Reserve, Napa Co., CA. 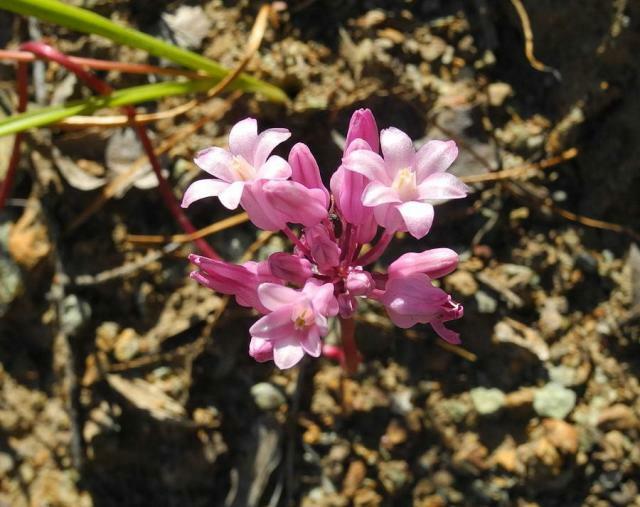 The plants on this trail have pink flowers. 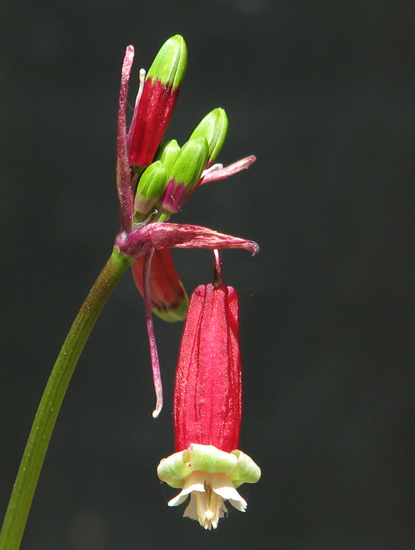 Dichelostemma ida-maia is commonly know as firecracker flower. 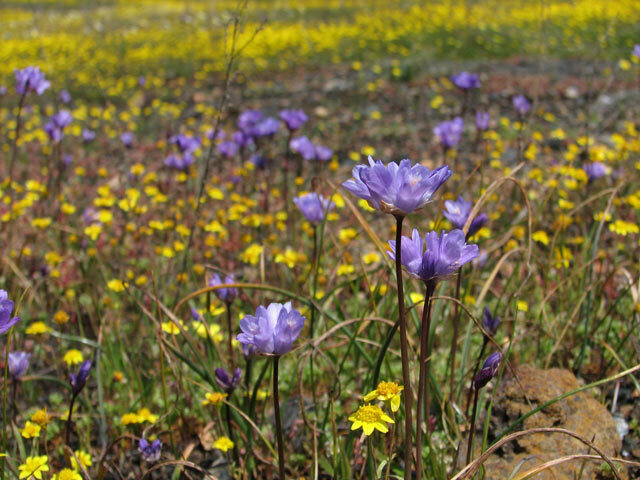 This species is found at the edges of woods, coastal grasslands, and mountainous regions from Mendocino County north to Oregon. 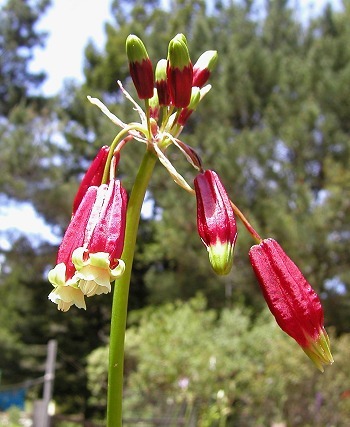 The flowers, appearing from May to July, are in open umbels of several pendant, long tubular flowers with a crimson red tube and short green reflexed tips. It is the only species in the genus that is pollinated by birds. Cultivation is not difficult but the plants must be given a dry summer dormancy. 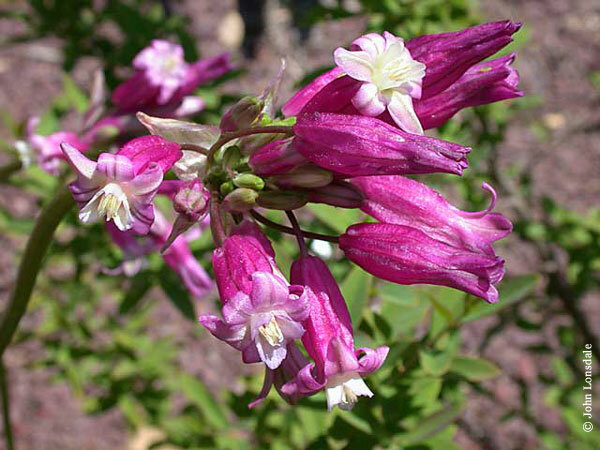 Fertilize when in growth and flower development and keep moist, but not wet, while in growth in winter and spring. Plant in the ground or in a deep enough pot that will have good room for roots. In coastal northern California this species seems to bloom better in full sun. 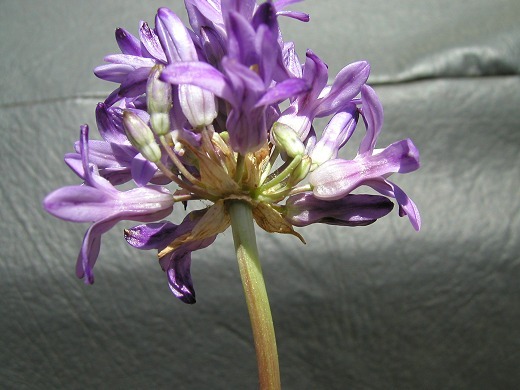 Photos 1-2 by Bob Rutemoeller shows an inflorescence where only some of the flowers have opened. 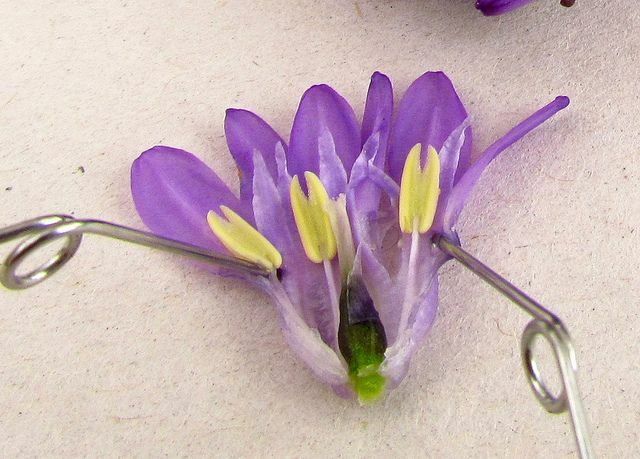 Photo 3 by Mary Sue Ittner shows all the flowers opened and hanging down. 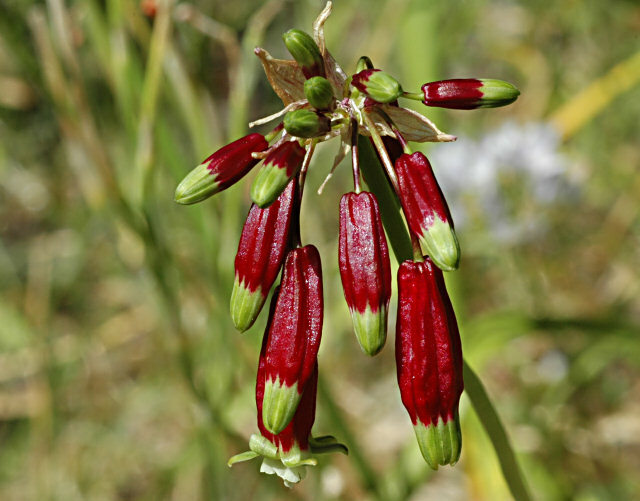 Photos 1-2 were taken by John Longanecker of plants growing in his dry garden in Placerville, California where they are loved by hummingbirds. 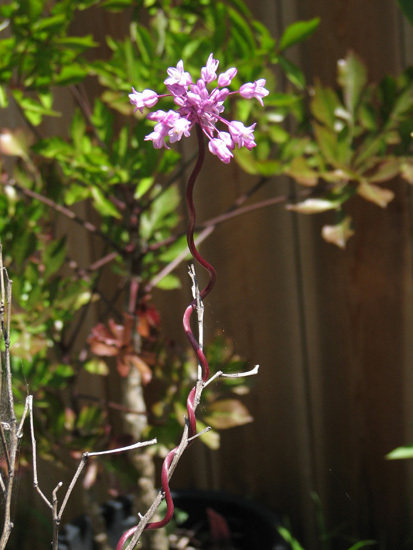 Photos 3-4 were taken by Nhu Nguyen showing the beautiful buds and the opening of the flower. 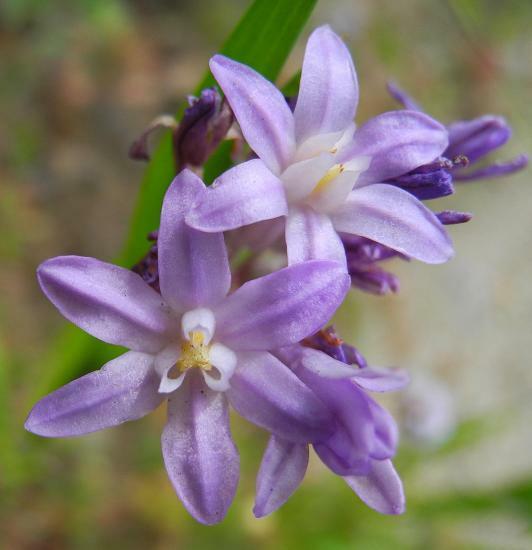 Dichelostemma multiflorum, commonly known as wild hyacinth or roundtooth ookow, can be found in the central and northern Sierra foothills, but also is found in the North Coast ranges and other areas of California. 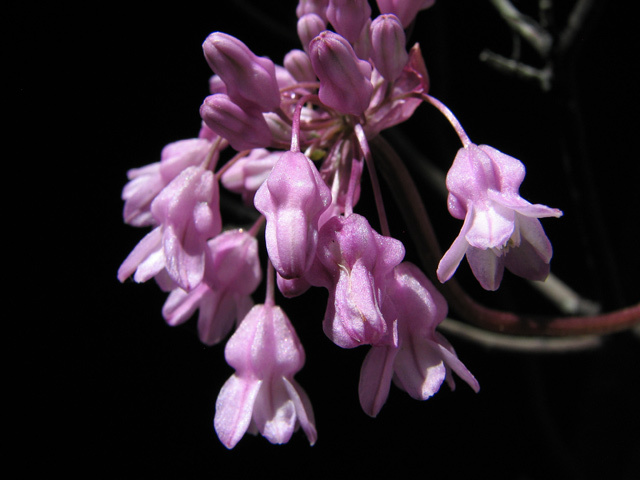 It flowers in May and June in many flowered ball-like umbels of lavender-pink to violet. 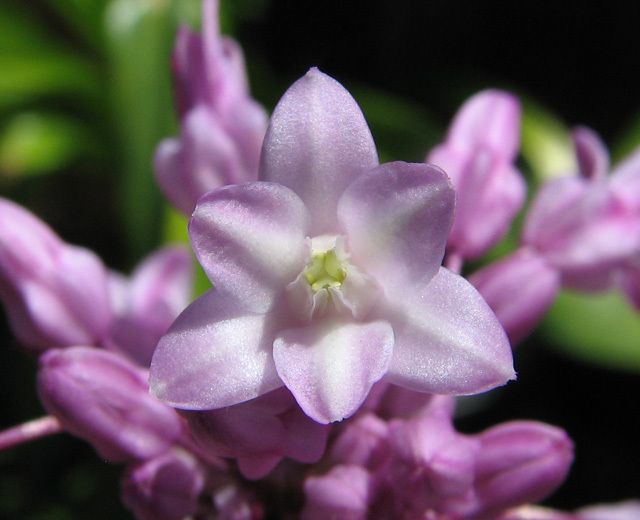 The filament crown is broad and round and inrolled, white or pale purple and the tube is very constricted at the throat. In the Bay Area, seeds planted in fall will sprout in about 2 months after some regular exposure to cold. This plant should be grown in full to mostly full sun. It does not require a deep container to do well, although that probably helps. It takes 4 years for plants to flower from seeds. Photos 1-2 by Bob Rutemoeller show characteristic features for this species. 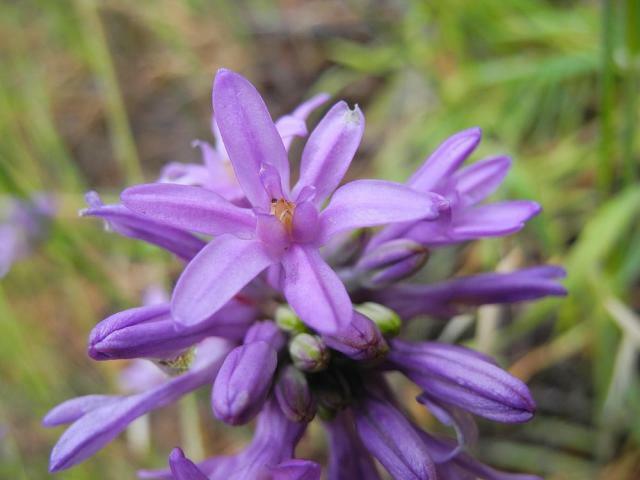 Photos 3-5 were taken by Nhu Nguyen of a first time blooming plant from seeds. 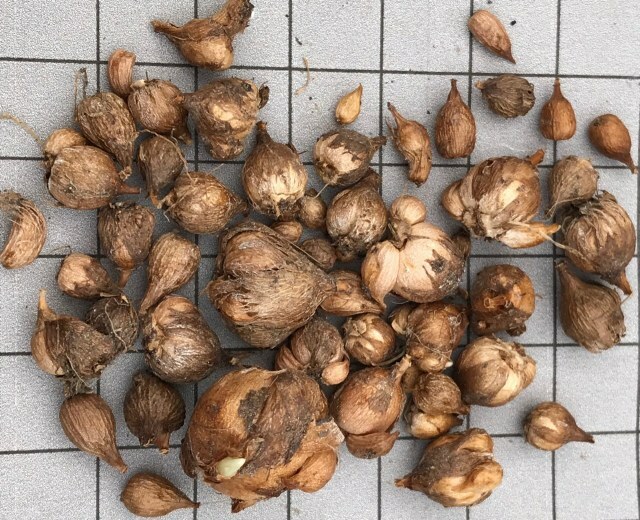 The corms on a 1 cm grid in photo 6 were grown for four years by M.Gastil-Buhl from offsets donated by Nhu Nguyen in PBS BX 345-25. 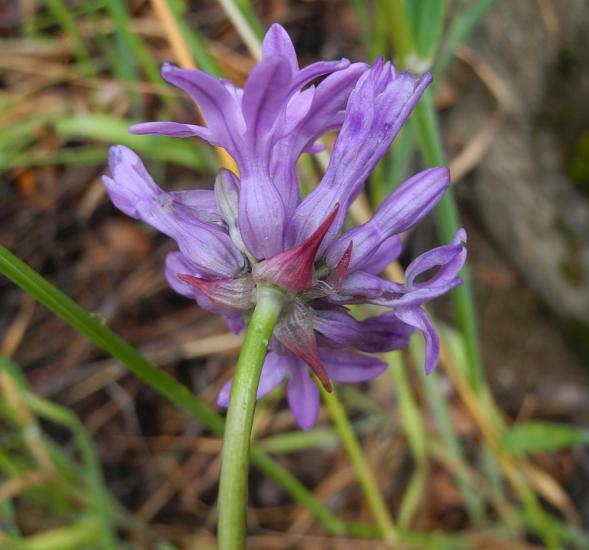 The photos below were taken by Mary Sue Ittner in Nevada County, California, where it was growing on a bank next to Highway 49. White and purple filament crowns were found in the same population as shown in the last two photos. 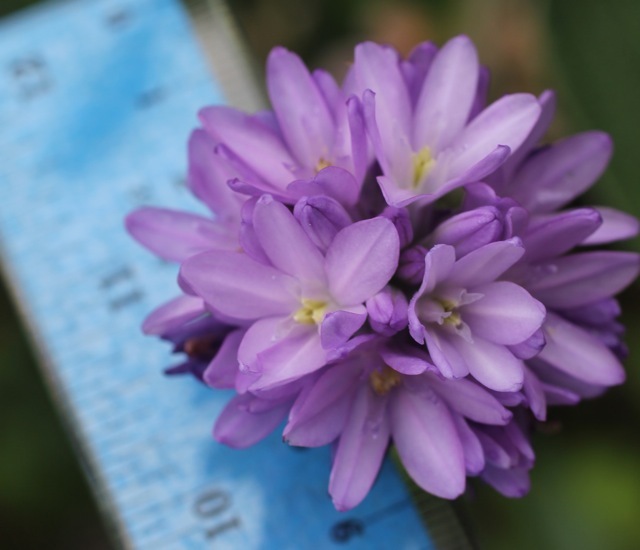 Dichelostemma venustum or Dichelostemma 'Pink Diamond' in the horticultural trade is an old name for a natural and sporadic hybrid. 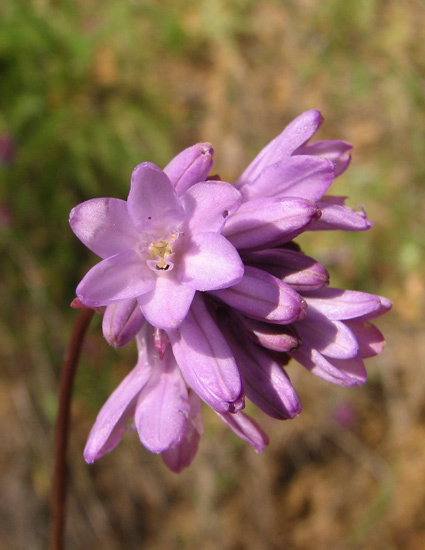 It is a cross between Dichelostemma ida-maia and D. congestum or D. multiflorum where the range of these species overlap. 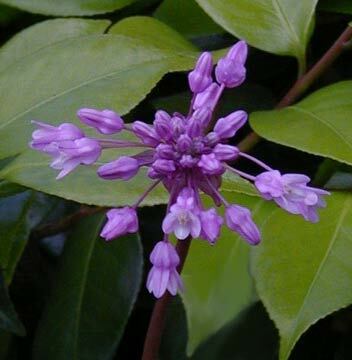 However, some members of our list when discussing thought it seemed more like a cross between D. ida-maia and D. multiflorum or D. volubile. It is rose pink and Jane McGary observes that it has a slightly twining habit. The first photo was taken by John Lonsdale. The next two photos were taken by Mary Sue Ittner. 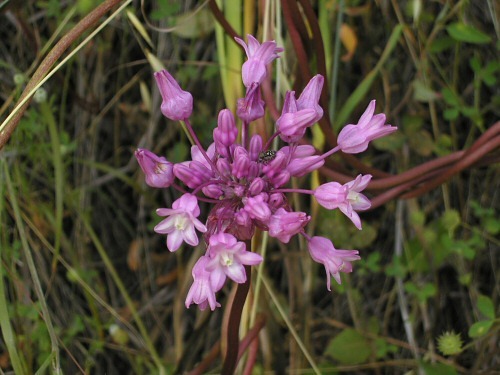 Dichelostemma volubile can be found under scrub oak and sends its flowers up through the shrubs by twining around the branches until the flower head appears above the drab shrub some two to five feet from the ground with a cluster of bright pink flowers. 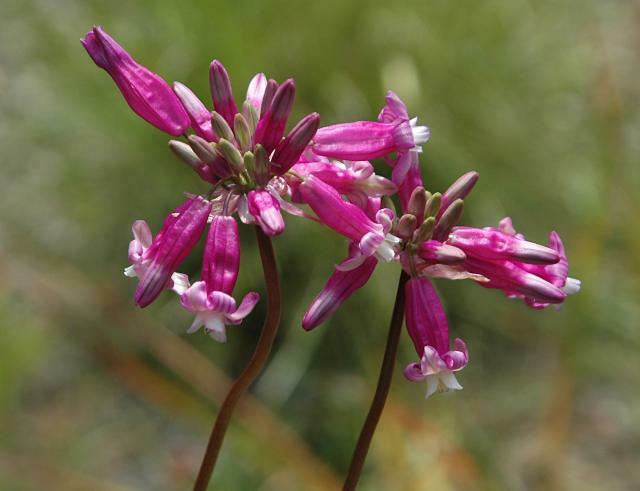 This plant is found on rocky slopes and flats, usually in chaparral, in the Sierra foothills and down the inner Coast ranges. 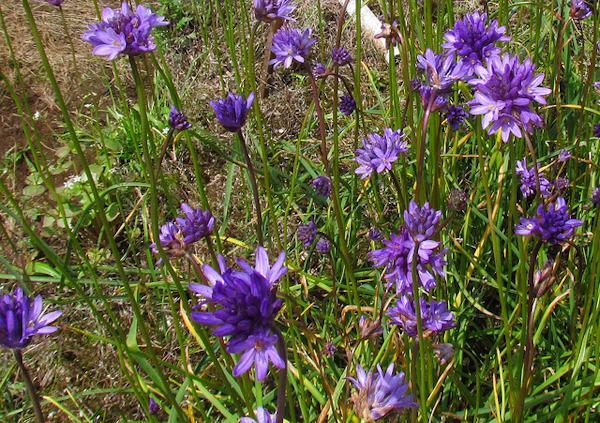 Plants are never found in full sun, although along the coast they can be grown in mostly full sun. 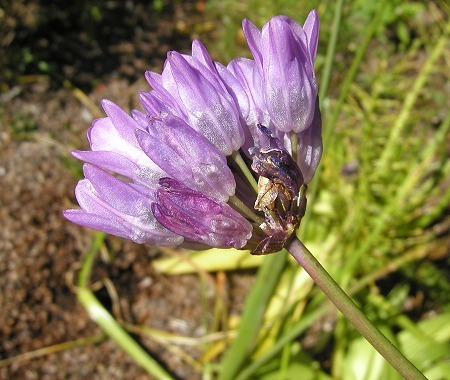 The corms are deeply set in the ground where the soil dries out completely in the summer. 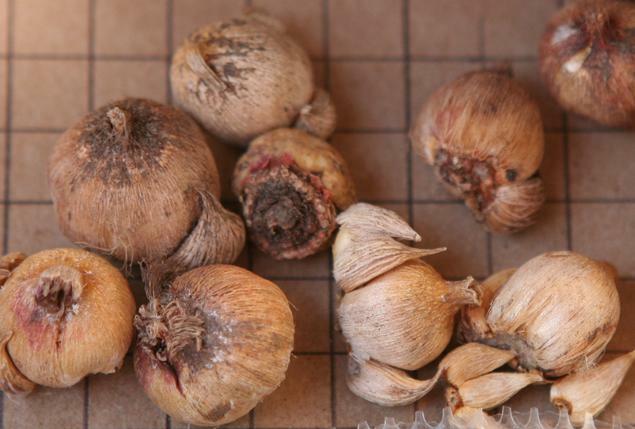 Cultivation is achieved by growing the corms in a deep pot (such as a 1 gallon) and allowing the plant to go into a dry summer dormancy period. When in active growth, water with a dilute fertilizer. 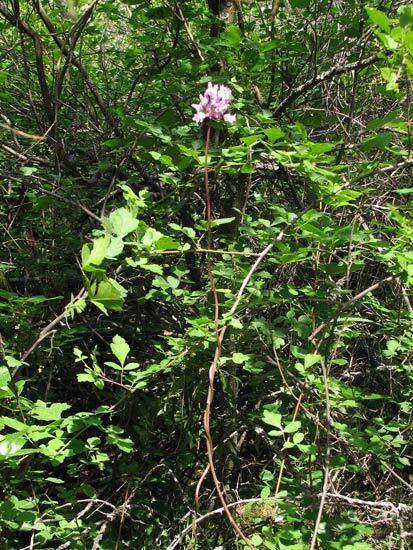 It is necessary to provide the inflorescence with a branch or stake to climb on. Photo 1 was taken by Doug Westfall. 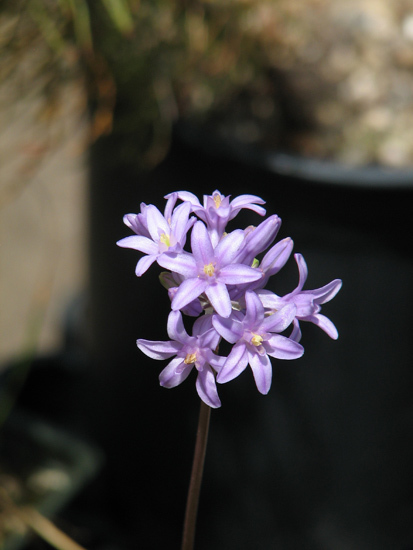 Photo 2 was taken by Bob Rutemoeller and shows plants blooming in Harry Hay's gardens in his unheated greenhouse, May 2004. Photo 3 by Jim McKenney was taken in his garden on May 21, 2006 (USDA zone 7 Montgomery County, Maryland, USA). It shows the entire above-ground portions of the plant. The scape is 47in (1.3 m) long. Photos 4 and 5 were taken by Mary Sue Ittner who has found it works well to place the pot next to a shrub in her garden where it twines happily. 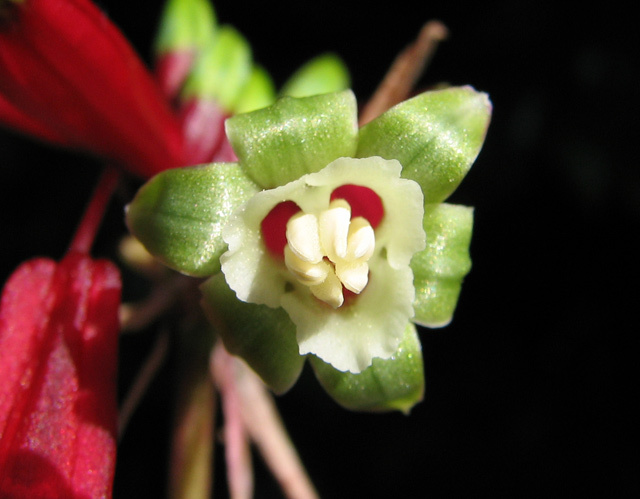 The photos below are of a plant grown by Nhu Nguyen showing the twining habit of the inflorescence and closeups of the flowers. 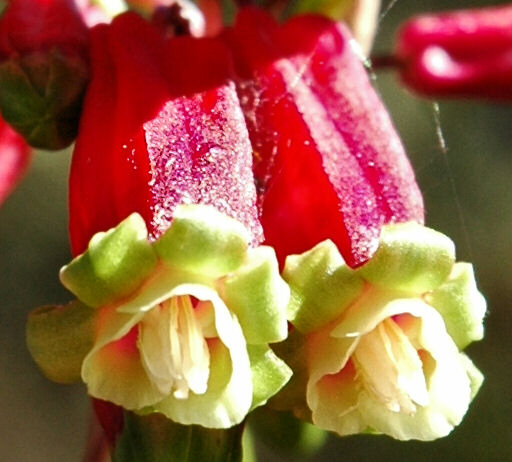 Photos 1-3 by Mary Sue Ittner were taken April 2005 on the Hite Cove Trail along the Merced River where this plant was twining through and around many shrubs and flowers including Poison Oak. 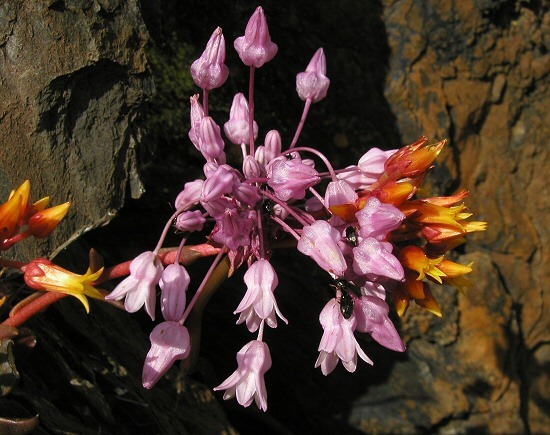 The first photo shows it with Dudleya cymosa on a rock with insects and the others show it growing along banks with annuals and twining around itself. 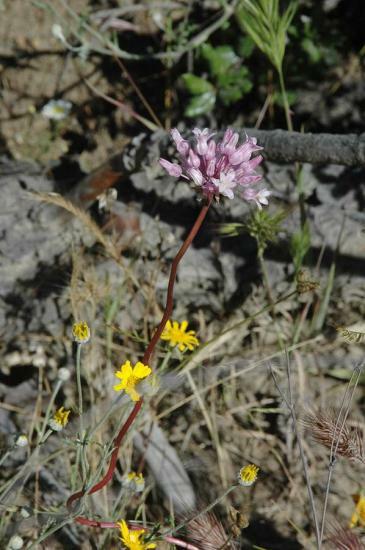 The last three photos were taken by Bob Rutemoeller and Mary Sue Ittner late April 2016 of plants growing along the bank next to Bear Valley Road in Colusa County, California. 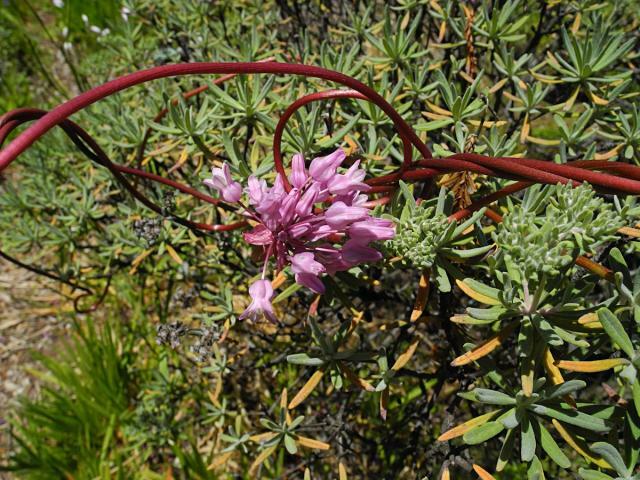 The first photo below by Nhu Nguyen was taken of a plant climbing amongst the shrubs at the western edge of Tuolumne county, CA. 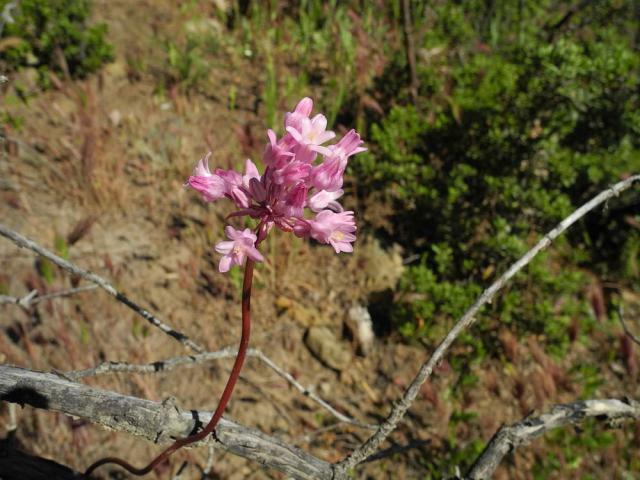 The last photo shows a plant growing in the wild near Shaver Lake, CA. 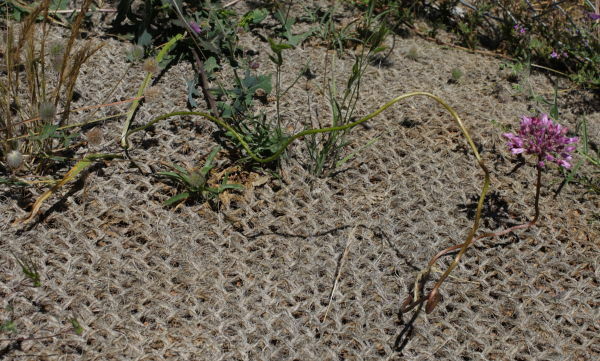 A highway crew had removed the brush and covered the ground in jute. The bulb then grew up through the jute. 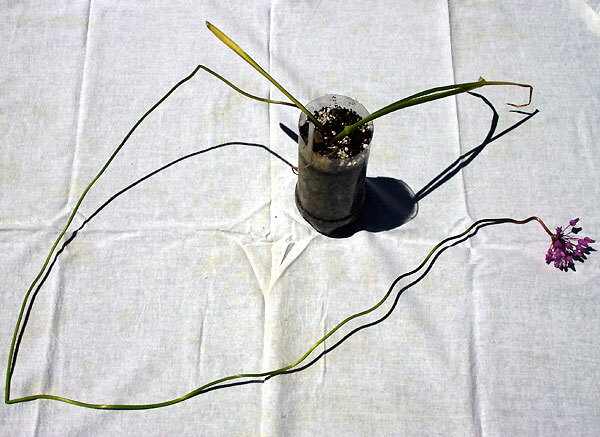 The two leaves, starting to die back in preparation for dormancy, can be seen at left, while the stem has wandered all over the ground looking for support. Photo by Michael Mace.